As mentioned a couple of weeks ago, one had attended a photo industry trade show at the Javitz Center. 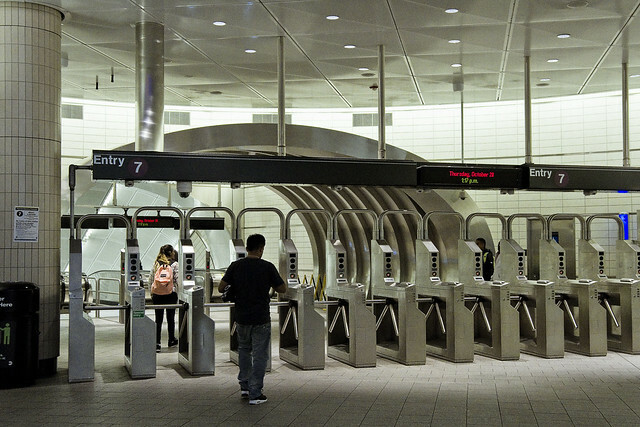 As this was the first time that circumstance had carried me to the newish Hudson Yards stop on the IRT Flushing line – conventionally referred to as the “7” – I decided to take a few minutes and record a few images. The name “Manhattan” derives from the word Manna-hata, as written in the 1609 logbook of Robert Juet, an officer on Henry Hudson’s yacht Halve Maen (Half Moon). A 1610 map depicts the name as Manna-hata, twice, on both the west and east sides of the Mauritius River (later named the Hudson River). The word “Manhattan” has been translated as “island of many hills” from the Lenape language. The United States Postal Service prefers that mail addressed to Manhattan use “New York, NY” rather than “Manhattan, NY”. The thing that kept on striking me about visiting the new station was a sensation of vertigo. 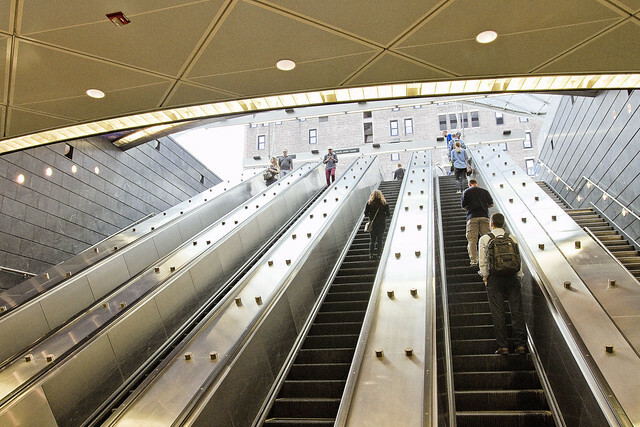 Normally, one is possessed of a sound and reliable bit of plumbing in the inner ear, but there was just something about the setup of the incredibly steep escalators which distinguish the new station that induced me to feel as if I was about to fall and tumble. Given the sort of things I know about escalators, which are – functionally speaking – indistinguishable from industrial meat grinders, this was a real concern for one such as myself. 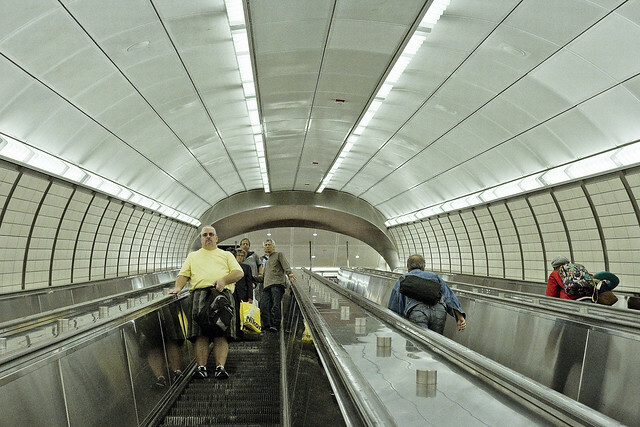 Escalators, like moving walkways, are often powered by constant-speed alternating current motors and move at approximately 0.3–0.6 metres (1–2 ft) per second. The typical angle of inclination of an escalator to the horizontal floor level is 30 degrees with a standard rise up to about 18 metres (60 ft). 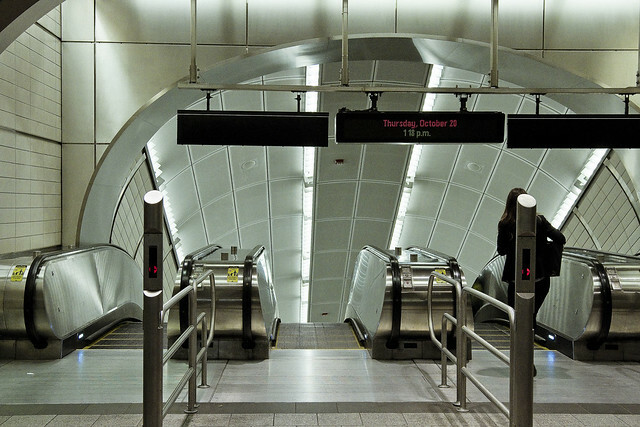 Modern escalators have single-piece aluminum or stainless steel steps that move on a system of tracks in a continuous loop. Perhaps it’s the angle at which they’ve been set at. 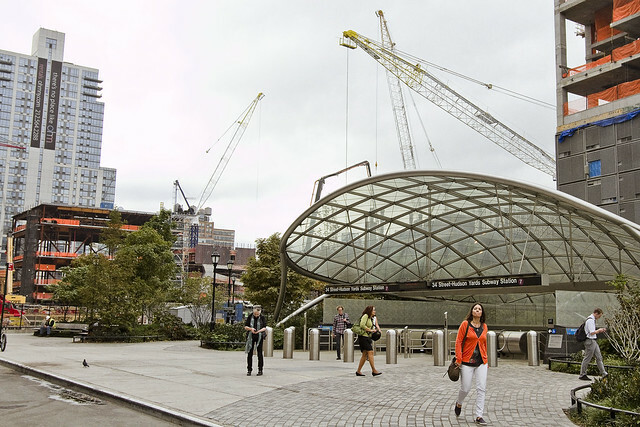 The Hudson Yards station platforms are found fairly deep in the ground, by NYC Subway standards. Comparable but still examples of the depth would be the 7’s Grand Central platform, or the 59th street and 3rd exit on the IND lines. Looking up rather than down, it felt a bit like the Smith/9th street stop on the F and G lines. Mr. Walsh from Forgotten-NY assures me that the deepest station in the system is in upper Manhattan, and I have few occasions to oppose his opinions so I’ll take his word on it, but Hudson Yards is deep. In January 2005, the New York City Council approved the rezoning of about 60 blocks from 28th to 43rd Streets, including the eastern portion of the West Side Yard. This did not include the western portion. In June 2005, the proposed West Side Stadium, to be built over the western portion for the New York City bid for the 2012 Summer Olympics, was defeated. Soon after, the Metropolitan Transportation Authority (MTA) thought of ways to redevelop the 26 acres (11 ha) yards. In conjunction with the government of New York City, the MTA issued a Request for Proposal (RFP) for 12,000,000 square feet (1,100,000 m2) of mixed-use space. The space was to be built on platforms over the rail yards, which would still be in use. There’s a mezzanine level where you’ll find the turnstiles, which is where the set of escalators in the shots above bring you. The mezzanine is fairly pleasing, design wise. There’s a whole bunch of arcing shapes moving against each other, tiled floors, and other “architect” looking features that are pretty pleasing to the eye. Or, to mine at least. The new construction, part of the city’s and the MTA’s master plan for the Far West Side, extended the IRT Flushing Line west from Times Square to Eleventh Avenue, then south to 34th Street. Although the West Side Stadium plan was rejected by city and state planning agencies, the 7 Subway Extension plan received approval to move ahead, as New York political leaders wanted to see the warehouse district west of Eighth Avenue and north of 34th Street redeveloped as part of the Hudson Yards Redevelopment Project, and subway service was to be an essential part of that effort. The extension also serves the Jacob K. Javits Convention Center, which was expanded in 2008–2014 and is located a block away from the station entrances. The big kahuna of the escalators, and the ones which caused me to begin to experience vertigo, are the ones which carry you down to the platforms themselves. Vertigo is when a person feels as if they or the objects around them are moving when they are not. Often it feels like a spinning or swaying movement. This may be associated with nausea, vomiting, sweating, or difficulties walking. It is typically worsened when the head is moved. Vertigo is the most common type of dizziness. The shot above is looking back up at where the previous photo was captured, and just the act of turning myself around forced my non camera arm to reflexively reach for some kind of support. 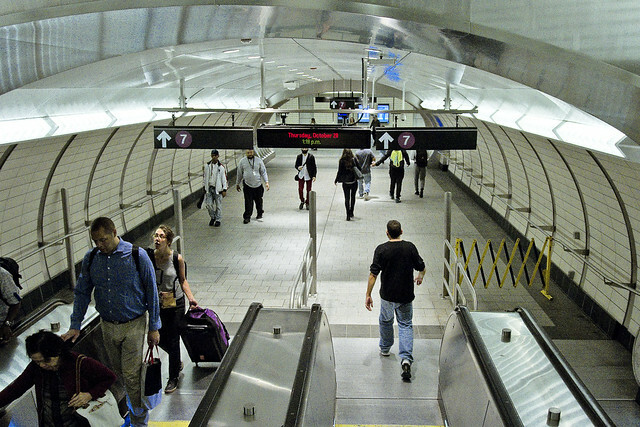 The MTA completed excavation of a 150-foot (46 m) long cavern in June 2009. The cavern was dug below the bus entrance ramp to the lower level of the Port Authority Bus Terminal and formed part of the eastern end of the new extension and connected it to the Times Square station. At the same time, tunnels were being dug northward from the machine shaft at 26th Street; soft ground at 27th and 28th Street required 300 feet (91 m) of ground to be frozen so that the tunnel-boring machines could easily dig through the soil. On December 21, 2009, it was announced that a tunnel-boring machine broke through the 34th Street station cavern wall. Both tunnel-boring machines were scheduled to finish the required tunneling in the spring of 2010. I think it’s the “leading lines” which did it. 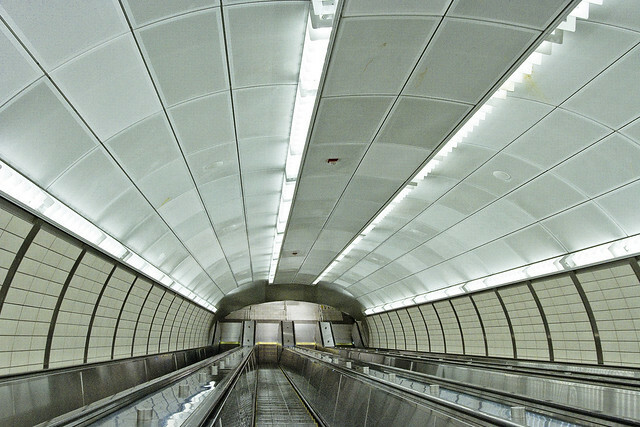 There’s a real “THX 1138” vibe to this station, which seems to be part of a modern design aesthetic MTA is following. I’ve been to the Second Avenue Subway construction site and the new stations about to come on line are visually quite similar to the Hudson Yards stop. THX 1138 (pronounced “T-H-X Eleven Thirty-Eight”) is a 1971 science fiction film directed by George Lucas in his feature film directorial debut. The film was produced by Francis Ford Coppola and written by Lucas and Walter Murch. It stars Donald Pleasence and Robert Duvall and depicts a dystopian future in which the populace is controlled through android police officers and mandatory use of drugs that suppress emotion, including outlawed sexual desire. Down at the bottom, there’s another vaulted tunnel which terminates at yet another barrel vault, which is where the two tracks for the 7 train are found. This is a terminal stop, of course, so there must a turnaround track somewhere down there but I’ll be godamned if I knew where it was. Felt like like I was halfway to hell if truth be told. Dizzy, I got nervous, my chest grew tight, and it was oddly warm on the platform itself – given its depth. Then again, Manhattan generally makes me experience both agita and angina, and often reminds me of hell. The main entrance, located at the southeast corner of the intersection of 34th Street and Hudson Boulevard, has a turtle shell-shaped glass canopy above it that allows light to shine on the upper mezzanine. The elevator is located south of 34th Street in Hudson Park, while the escalator entrance is located further east, closer to the boulevard. The ventilation building will be built over by developers at a future date. The second entrance, which will contain escalator entrances is at the southwest corner of 35th Street and Hudson Boulevard East. 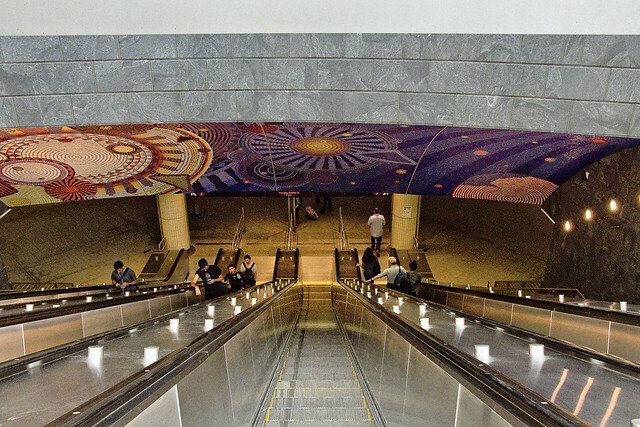 At both of the exits, the staircases and four escalators each go down 40 feet (12 m) to a fare control area, then another 80 feet (24 m) to the common lower mezzanine; the main entrance was completed by summer 2014, while the secondary entrance is still under construction and will be completed by 2016. It’s definitely the ‘leading lines’, as you say. You depend on visual cues to know which way is up and down. The tiling and other design features in many of these inclined passageways in the subway system seem to follow the angle of inclination. What they really should do is reinforce the actual horizon. Best advice when suffering seasickness: look to the horizon. I wonder why they don’t follow this rule when designing these huge projects.